Hire A Hot from one of our packages and we’ll deliver and set it up ready for you. 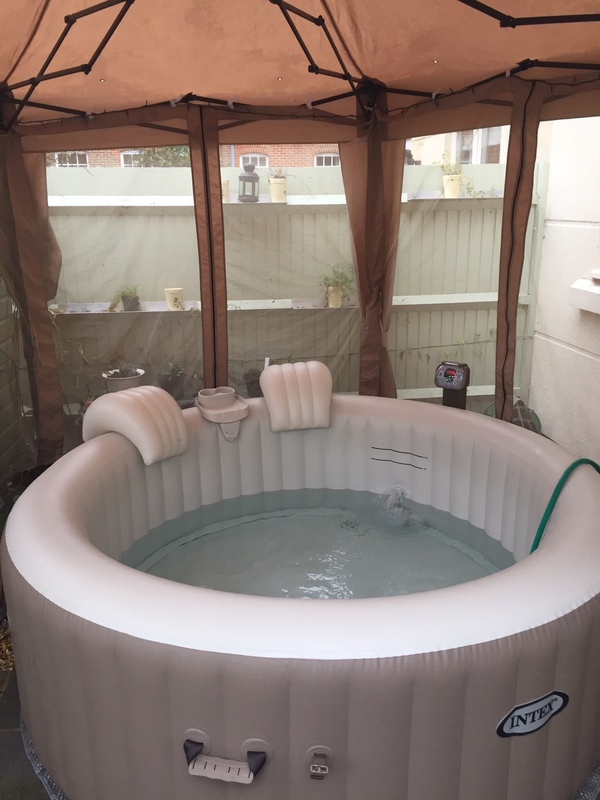 Our hot tub hire service is an excellent way to unwind and relax and our hot tub packages are available for weekend hire, whole weeks or extended if you desire. We can’t think of any experience better than stepping into a hot tub spa at the end of the day, or indeed a stressful week at work and just letting your aches and pains fade away. The best part about it is that we do all the work, you just relax. All that we require is a three pin electric outlet and within a short space of time, you and your friends can be languishing in your very own hot tub. With 120 jet bubbles in our 4 person tubs and 140 in our 6 person tubs, along with a thermostatically controlled heater which you set to your preferred temperature (up to 40c or 104f ) your Hot tub hire will make your weekend one to remember. So if you’re having a Hen weekend, or in need of a relaxing stress-free one, or maybe you want to treat the birthday girl to a truly unique experience at a fraction of the retail cost to buy a hot tub, we’re sure they won’t be disappointed with their very own hot tub hire. 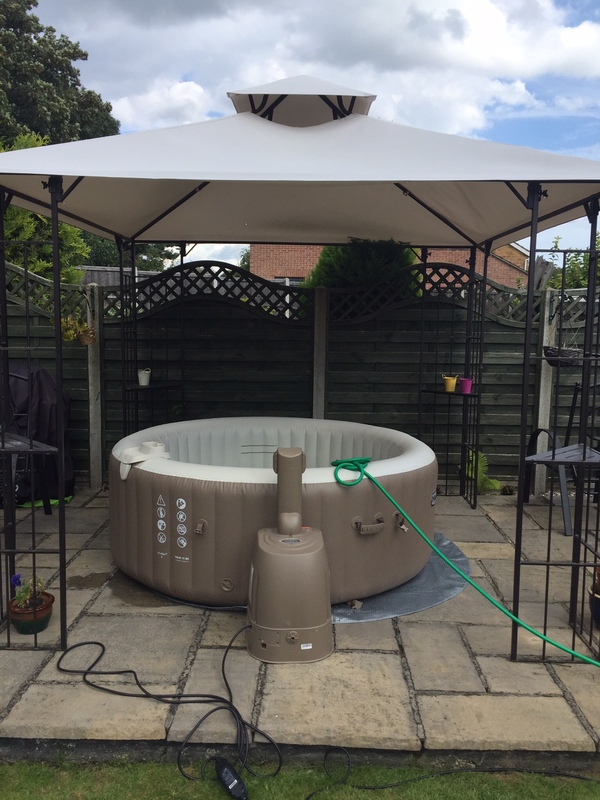 To make your hire that bit more special we are able to offer hot tub hire packages, these can include an inflatable hot tub, a marquee, lighting and aromatherapy fragrances, starting at £135 for a four-person tub. If you are hiring for a party then why not take our party package which includes all the above plus glow necklaces, bangles and tumblers! All our hot tubs are Intex Pure Spa Hot Tubs as featured on How To Spend It Well: House and Garden with Phillip Schofield. All our packages are based on Thursday to Monday hire and include set up with full instructions and all treatments required for the duration of hire. How fast do can you deliver? We can usually deliver same day or next day as long as we’re not fully booked – either way, we’re fast! Best to book in advance where possible, as our hot tubs are in demand and we can get booked up fast. Yes. Every hot tub comes with a thermal cover to retain the heat when you’re not using it. Also helping reduce your electricity costs. Yes. We will need to show you how to use the hot tub and show you what chemicals to add. It’s all really easy but you will need to be there. Can I put the hot tub anywhere? We can put the hot tubs on patio, decking, grass or gravel as long as it’s relatively level and flat. We fill the tub using your water supply, with your hose. If you don’t have one, let us know when you call and we’ll do our best to accommodate you. Setting up usually takes about 15 minutes and filling usually takes 1-2 hours depending on your water pressure and the size of tub you go for. Can I hot fill the hot tub? No. It will break the unit if water hotter than 40 degrees goes through them. It depends on the outside temperature but it usually takes 12-14 hours (in cold weather please allow 24). But we will aim to deliver the tub in plenty of time so that when your weekend starts, the tub is lovely and warm. You will need a large, level, flat area at least 6.5 foot by 6.5 foot. You will need a working hosepipe connected to the mains too. If you have an extension lead that may help (if not, don’t worry, we bring them! ), we supply weatherproof boxes too that the extension lead sits in to keep it safe from rain at no extra cost. Most of our customers pay cash on delivery but we take VISA, Mastercard and other mainstream credit and debit cards if you prefer. We accept cheques but these must be cleared in advance of your hire so please send full payment at least a week before your hire. £50 Deposit. Paid by cash, card or Paypal to secure your booking – we accept all major credit and debit cards including Visa and Mastercard. This is fully refundable as long as no damage has been made to the hot tub (please see terms and conditions). Deposits are only refundable 10 days or more before your hire period starts. How many people can I fit in the hot tubs? Do I need to add chemicals to the hot tub? We will add the chemicals (chlorine etc) to get you started. Then, each day, you simply test the water and add the chemicals that we explain in full when we deliver the tub. It’s really easy and we’ll leave you with full instructions. If you get stuck, we’re only a phone call away. Do I need to add any water? No. Once the tub is filled, it will be good for the duration. In the rare circumstance that you lose a lot of water because of splashing, you may need to top up, but it’s unlikely. Are the hot tub electrics safe? Our tubs electrics are safe and checked/replaced regularly. We provide a Residual Current Device (RCD) breaker as standard to keep you safe. Obviously electrical items should be kept away from water just as you would if you were in a bath, so no hair dryers or anything silly. Can hot tubs be hired during winter months? Yes. They are great in summer because of the sun on your face but we think they are even BETTER in winter! Because when it’s cold outside but you’re toasty and warm inside the hot tub, there’s no better feeling! We’ve even been in hot tubs when it has snowed and wow, what an experience! The colder it is outside, the more you appreciate being able to all warm and relaxed. We hire our hot tubs all year round. Can I use a hot tub if I'm not in full health or have heart problems? We recommend you only use our tubs if you’re healthy and fit. Please talk to a doctor if unsure. Do we need to empty or clean the tub before you collect it? Yes, we will walk you through how to do it when we install it for you. How much does it cost in electricity to run? It depends on how much you pay for your electric, how hot you have your spa etc. But a rough estimate going on what the experts say is about 60 pence per day after the initial heat up. For your hire period, you’re probably looking at less than a cup of coffee. How much does it cost to fill with water? People falsely assume it costs a lot to fill a tub. In fact, it costs significantly less than the price of a 4 pack of bottled water. Can I put anything in the hot tub like soap or bubble bath? No. Please don’t add anything to the water other than the chemicals provided. Otherwise, it may damage the hot tub or mess up your water and is against our terms and conditions. How much water is in the tub? Can I move the hot tub once it has been delivered? Once setup, the tub must stay in this position for the duration of the hire. Do I need to shower before getting in the hot tub? Yes. This will ensure an enjoyable, safe and healthy experience for all. If we love our hot tub, can we buy it? Yes. You’d be surprised how many people do decide to buy the hot tub at the end of their hire period, because they just don’t want to give it back! Give us a call for the absolute best prices on NEW and EX-HIRE hot tubs.